GREENBELT, MD (April 14, 2017)- A popular quote states “Empowered Women, Empower Women” and the Women of Prince George’s is using that very standard to inspire their 7th Annual Women’s Conference. 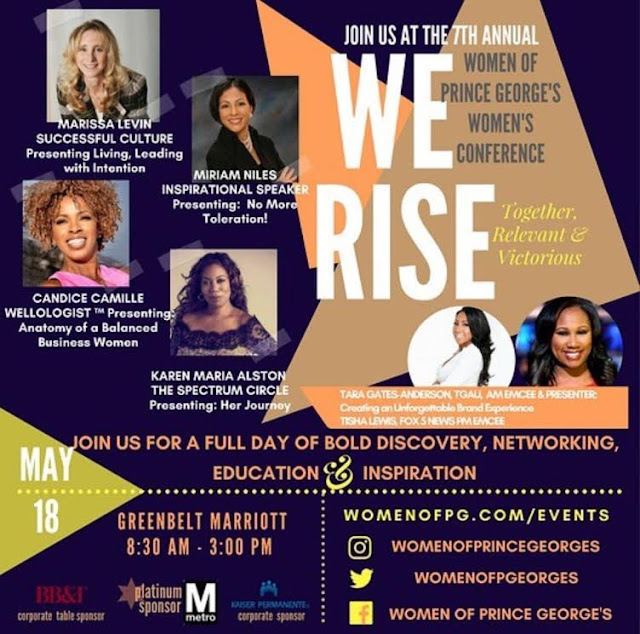 On May 18th, 2017, the Women of Prince George’s Women’s Conference will be held at the Greenbelt Marriott from 8:30 AM-3:00 PM, with a theme of “We Rise: Together, Relevant and Victorious”. The annual event consists of a full-day of successful speakers, engaging sessions, exclusive door-prizes, and other opportunities to connect business women and entrepreneurs in the Greater Prince George’s County area. The event will be hosted by Tisha Lewis, Reporter and Anchor of Fox 5, and Tara Gates Anderson, Founder and CEO of the media conglomerate, TGAUnified. Spotlight speakers include Karen Maria Alston, Copa Style Magazine’s 2015 Woman of the Year and Founder of The Spectrum Circle, Marissa Levin, 20-year CEO of Successful Culture and Best-Selling author, and more. The Conference’s “Success Panel” features women who have achieved success in business and entrepreneurship, and will share some gems on how attendees can do the same. Greetings will be provided from the office of the Prince George’s County Executive Rushern L. Baker, III. Representatives from Federal and County offices will be in attendance with information on procurement opportunities and information on how to start a business as well. When asked about the conference’s 7th year running, Stephanie Bolton James, Founder of Women of Prince George’s said “I am so pleased that we are in our 7th year! Each year we get more newcomers, and it’s so rewarding to see them leave with relevant industry insight and entrepreneurial guidance for women. Providing resources for professional women and business owners is our goal. When the women are successful, the family thrives as well as the community and the region.” Our conference is geared towards all professional women in the Washington Metropolitan area. In addition to the annual conference, The Women’s of Prince George’s hosts quarterly events to provide professional women with resources and inspiration to succeed. The Women of Prince George’s Women’s Conference is sponsored by Kaiser Permanente, Washington Metropolitan Area Transit Authority, Capitol One, BB&T, and Dimensions Healthcare. For more information and to purchase tickets, please visit www.womenofpg.com. If you’re interested in speaking with Stephanie, and/or covering the conference, please send an inquiry to candice@candicenicolepr.com. The Women of Prince George’s is a networking experience for established entrepreneurs and professional women in the Greater Prince George’s area. We provide an educational experience, inspiration and resources to support business growth. When the women are successful and educated, the family thrives, as well as the community and local economy. Through our business relationships around the beltway, we are able to connect businesses owners with neighboring markets as well as provide exposure to businesses targeting the community. We are the premier networking event and resource for women in and around Prince George’s County. We provide mutually beneficial business relationships and we showcase an elite roster of successful businesswomen with inspiring stories and ties to the Greater Prince George’s community and beyond.